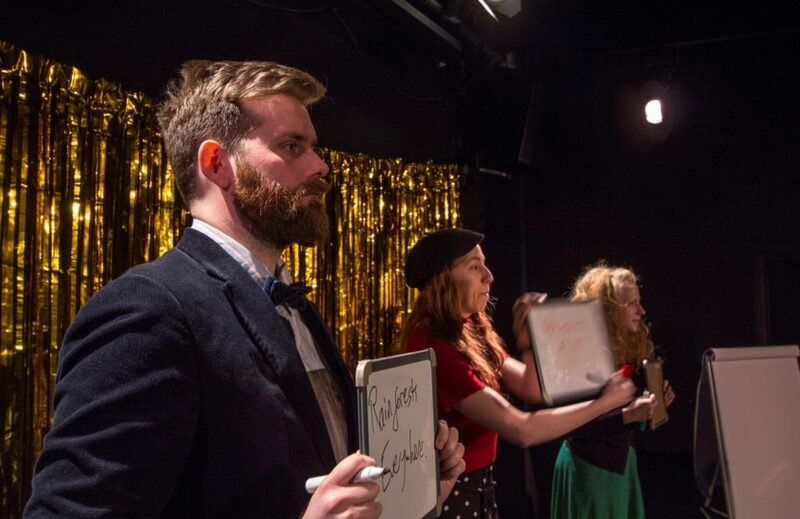 Presented by Dirty Rascals Theatre Company, ‘I Want You To Admire Me (But You Shouldn’t)’ is a multi-layered, intelligently devised study of human nature. Through the façade of a new reality TV show, Pavlos Christodoulou and his small troupe of contestants set out to examine humanity’s obsession with praise and shame. Upon arrival, each audience member is given a voting card with which they are given the power to choose winners and losers, and take sides on both moral and personal issues. Rounds encourage the three contestants – Harold, Emily and Hannah – to think of the best and worst possible scenarios in a given topic and up the stakes for the next person. The topics are initially light-hearted and allow the company to provide a great number of laughs, but as the game carries on, the examination of the darker side of the obsession we all have with being adored begins to come through. Soon, the focus shifts to the speed at which we so easily set about shaming and humiliating other people. With an all too recognisable parallel drawn between this fictional game show and so many of our existing reality television shows, it’s hard not to be moved by the tirade of abuse the contestants must withstand to “earn” our admiration. The most affecting point the show makes is that nothing works. Whether it’s the host’s unwavering, boundless energy and multitude of compliments to the audience or the contestants’ neediness in fulfilling their demands; I did not feel any genuine investment in any candidate coming through as the winner. I did not admire any of them, and perhaps this is the point. Perhaps the point the Rascals have made is that there is no dictionary definition for an icon. The whole show is underlined by pitch perfect music from David Denyer on the piano; and clever movement sequences symbolising the damaging psychological effects of the shame/admiration dichotomy regularly interject the gameshow. These are hard to watch and culminate in a somewhat predictable finale involving feathers and fake blood, but they are very well executed by the performers. In short, this piece leaves you feeling like the bad guy, but also reminds you how close we are as a society to truly damaging our people if the shame we insist on placing on each other doesn’t stop. It’ll undoubtedly stick with me for a long time to come, and the Dirty Rascals should be proud of the questions they’re asking. You could even say I admire them for it.